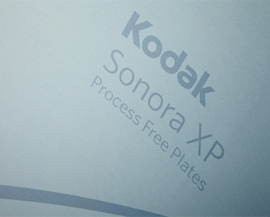 Sonora XP Plates are unlike any other plate. They offer the cost and waste reduction benefits of process free plates, plus they deliver the quality, productivity, and print capabilities of mainstream processed plates. Not only can they satisfy the needs of commercial sheetfed print production, they also deliver strong print performance on commercial heatset and coldest web presses, in offset packaging applications, and even in short run UV. They're also available in 0.40 mm gauge and VLF size formats, making them suitable for a wide range of applications. #1 Network, Inc. © 2014. Web site design by BG Web Designs.